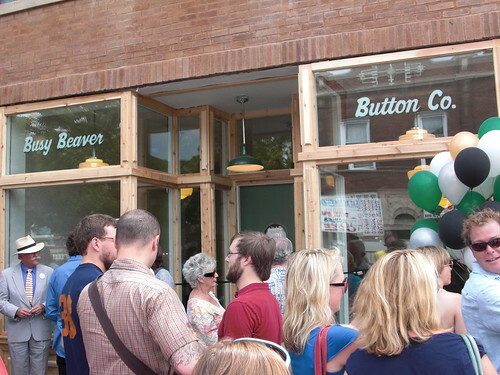 Chicago's own Busy Beaver Button Company just moved to a shiny new storefront in Logan Square, where it will continue cranking out pinback buttons for the masses. 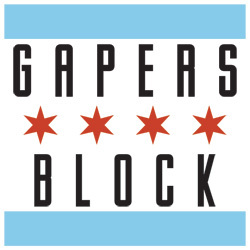 The company began as the brainchild of Christen Carter, who fostered its growth from the early days (parents' house, mom poised over the manual button maker) to fledgling independence (basement of Christen's Logan Square home) to real, live, grown-up company (now, now, it's happening now!). Busy Beaver received a Small Business Improvement Fund grant from the City of Chicago to cover half the costs of building out their remodeled storefront location, and doors officially opened in early August. The new space comes tricked out with the latest in green: Low-E glass windows, formaldehyde-free plywood, recycled flooring, salvaged fixtures and tile, and -- the biggest investment -- geothermal heating and cooling. Upstairs there's a green daycare owned by a friend of Christen's, and an organic garden is planned for the backyard. Busy Beaver enthusiasts gathered on grand opening day, August 8, to cut the ribbon -- former and current employees, punk marching band Mucca Pazza, alderman Rey Colon, family and friends. Christen's parents stood arm-in-arm, smiling as they watched a slideshow projected on a smooth white wall in the new space. Images of the construction process flickered past: a boarded-up storefront, lumber and tile, dust and mud. Artists, musicians and writers staff the button-making process, including printing and designing custom-made buttons in a variety of sizes, ready to be ordered from the Busy Beaver web site or sold via gumball-style vending machines. 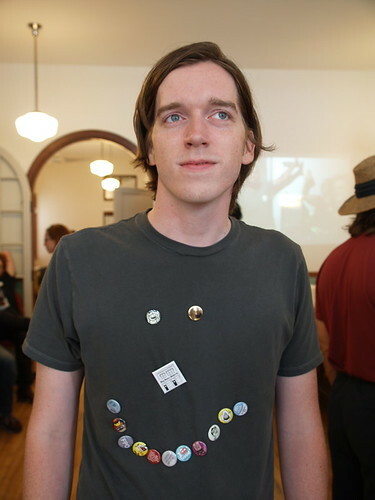 The whole operation, and the populist form of expression that is the wearable pinback button, is a testament to the power of small things adding up to large things. Got a slew of buttons? You've got a campaign. Even in an age where Facebook and Twitter broadcast one's status, a button still carries a message. 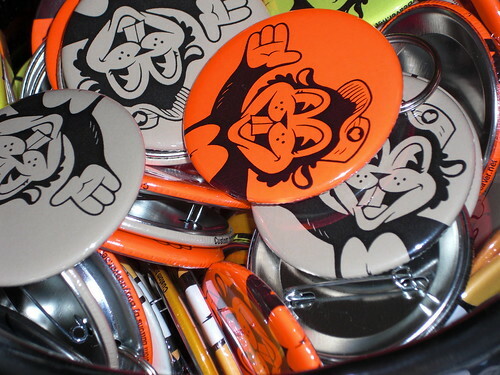 I spoke with Christen about the past and future glory of Busy Beaver Button Company. How did the company get its start? I was living in London in 1995, working abroad in college, I realized no one was doing these little pin-back buttons, which was like a punk size... some friends in a band [Guided by Voices] said "yeah, if you do [one-inch buttons], you'll be the only one..." I came back to the U.S. ... my parents were living in Ohio at the time and they were like, "What are you going to do now that you're back?" And I was like, "I'm thinking about starting a button company." What were some of the challenges you faced, in order to get this new space? When we were initially approved for our permit [for the new storefront], the inspector came, we thought everything was fine ... But it turns out we were approved for the wrong permit ... And that was a three-month delay. Everyone we talked to -- the alderman, my banker, people who worked on the inside at City Hall -- everyone was trying to help us out and pull together their people. The city is paying for half of all this construction -- so I kind of love 'em -- but the whole permit thing was kind of soul crushing. Where did you find the cool vintage-y fixtures and materials? We salvaged a lot from Parisian Novelty, the oldest button company in Chicago; they were around for like 120 years. I've been enamored of that business as long as I've had Busy Beaver. When they were closing, I remember going in there and buying a machine I didn't even need. You'd walk in there and it was like it was 1940. How have things changed since the company began? There's a lot of competition now because of the Internet, and a lot of people just kind of copied our prices. Which is funny to think about, because I didn't know what I was doing, so the standard is all just based on what I thought was a fair price when I was barely out of college. What are your plans for the future of Busy Beaver? There really is an art to having a business that I didn't notice until last year. I've been developing myself as a business owner, and it's a very introspective thing; it's also something that I hope to grow. I've been part of DePaul's roundtable for small business owners. 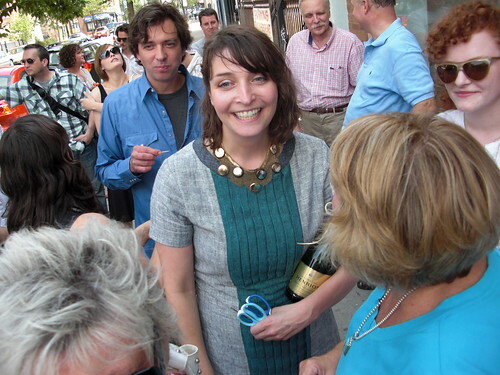 And I have a mentor, and she's been really, really helpful. I've been reading a lot of books. It's kind of become my hobby now. I felt like I either had to really grow the business or kind of let it go. 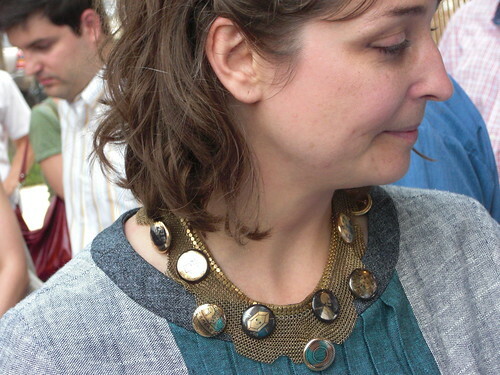 We were the first button company to do what we do and a lot of other people are doing it now. We kind of innovated little things along the way. But everything you do, somebody copies. So I think we just have to keep going, keep innovating. Lindsay Muscato is a Gapers Block staffer who escaped from a toaster fire in Buffalo, NY at the age of four. 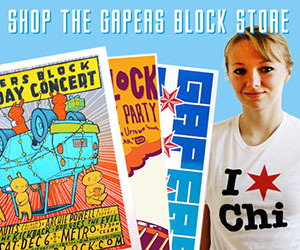 She is a writer, performer and arts manager in Chicago. Read more at lindsayliveshere.org.